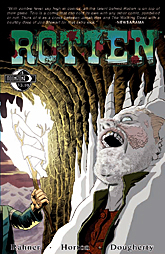 ROTTEN SIGNING: Saturday 12-8-12, Odyssey Comics and Coffee, Vancouver, Wash. Rahner with Brandon Jerwa, Eric Trautmann, Greg Rucka and others. Feb. 9: Rahner & Horton will sign Rotten Vol. 2 at Seattle's UNIVERSITY BOOKSTORE! 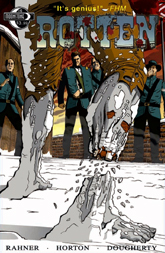 March 4-6: ROTTEN will be at the Emerald City Comic Con! 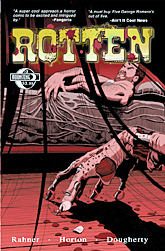 - The ROTTEN booth in the Exhibition Hall will feature the authors, autographed copies of back issues, posters and something special: limited edition, hand-printed and embossed collector's covers of ROTTEN No. 1 by master printer Colin Clark. - 1 p.m. Friday: comic book panel, "Drawn of the Dead," with Rahner, Michael Avon Oeming, Stephen Lindsay and Steven L. Frank. - 5:30 p.m. Friday: Rahner and Horton at Last Call @ The Nabob, hosted by Creators Edge Press, also featuring Stephen Lindsay. - 8 p.m. Friday: Rahner at Prom Night of The Living Dead Halloween Costume Party. 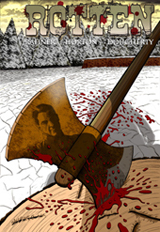 - 3 p.m. Saturday: Rahner introduces Bruce Campbell prior to "Evil Dead" screening. - 3 p.m. Saturday: Horton moderates the panel, "Zombies Ate Jane Austen's Brains! "with Dr. Laurie Rozakis ("Zombie Notes"), Steven Hockensmith ("Pride and Prejudice and Zombies"), Kevin David Anderson and Sam Stall ("Night of the Living Trekkies"). Check the schedule on this one, as it still seemed to be developing. 11:30 a.m. Sunday: Rahner's brunch interview with Malcolm McDowell: "Exploring Popular Fan Culture." This one should be fun. 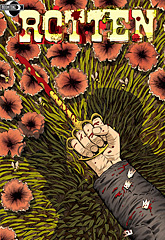 For the full schedule, prices and all the nasty details, go to www.zombcon.com. 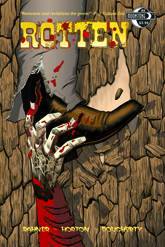 SEPT. 25: ROTTEN will be at the Jet City Comic Show during the day AND the Revenant Film Festival at night. Find out more about the comic show at Seattle Center HERE and the independent zombie film fest HERE. 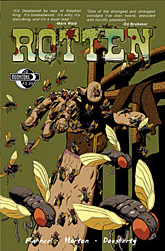 MARCH 13 & 14: ROTTEN will be at the Emerald City Comicon. OCT. 29: "HAVE A ROTTEN HALLOWEEN" at Seattle's Northwest Film Forum. Rahner and Horton host a filthy Halloween party, show a movie, maybe drop their pants. Developing. CLICK HERE FOR DETAILS AND TICKETS. Sept. 26: Rahner at the REVENANT FILM FESTIVAL at Seattle's Museum of History and Industry. Check out REVENANT MAGAZINE HERE. They like stuff that's ... uh ... decaying. Saturday, 8-15: Benefit signing and dinner at Comic Evolution! Saturday, 8-22: Signing at the Comics Dungeon! 9-26: Revenant Film Festival appearance! Details to come. 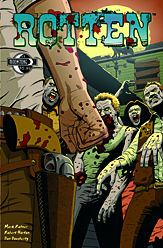 10-24: ROTTEN at the Bellingham Comicon! 10-29: "Have a ROTTEN Halloween." Rahner & Horton host an evening of filth at the Northwest Film Forum. Below: Rahner and Horton hosting the Guinness record-breaking Zombie Walk in Seattle July 3. > Read Agent J.J. Flynn's Diary! > Visit Moonstone's Rotten page!